“The Avenue” refers to the original approach to the Manor House leading up to the drawbridge over the moat. 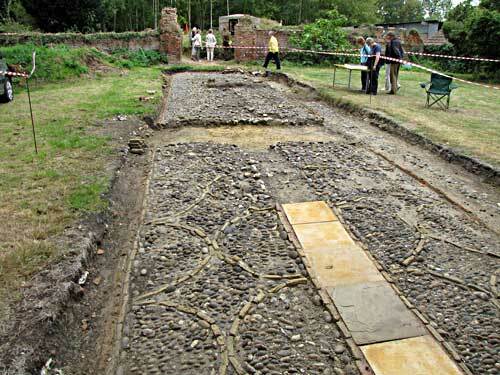 For many years grassed over, hidden underneath lies a former surface which was revealed by excavation. 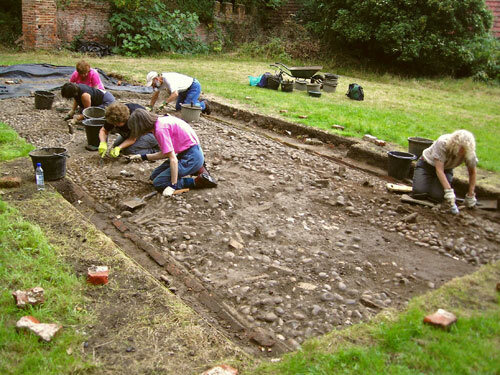 Since 2007, we have been excavating the entrance avenue which runs from the (fallen) Tudor brick arch to the entrance (via a bridge, no longer present) to the moated buildings: only their foundations remain. It is about 3.5 metres wide and 23 metres long (plus a 1930s-built concrete replacement length). 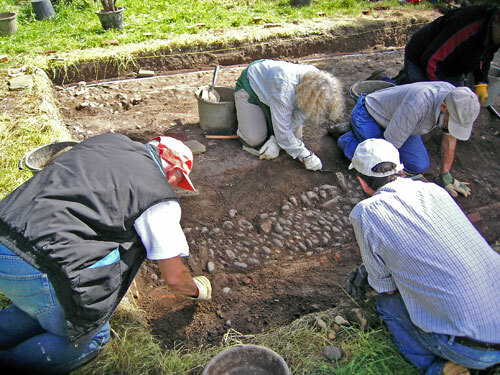 The excavated avenue surface is found to be edged by red and by yellow bricks, and is made of patterned cobbles and yellow bricks set on a layer of gravel, which is itself bedded on a layer of very large flints. Inside a central strip defined by two lines of yellow bricks, it is believed that paving stones were formerly laid, but have been robbed out, probably in Victorian times. The yellow bricks are Dutch bricks fired from river mud, probably from the river IJssel, which were popular in the middle 17th century for paving. Unfortunately, however, the bricks do not permit close dating and we are still seeking confirmation of this dating from our further excavations. 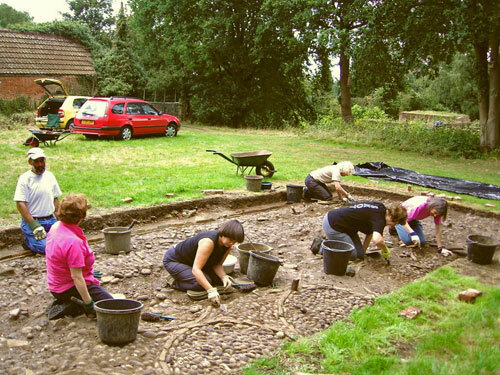 In 1659, Sir Richard Bettenson purchased Scadbury from the Walsinghams, and is known to have spent £800 on improvements after his purchase.